As a cast member at Disneyland® Resort or Walt Disney World® Resort, you help make that dream a reality each and every day. With so many different roles available throughout our theme parks and resort hotels, each cast member plays a unique, but equally important role, in sharing the magic with our guests. Follow the links below to apply for hourly roles at your desired location! Wondering if you can apply for opportunities without currently living in Anaheim or Orlando? The answer is yes! Interviews can be conducted over the phone and future start dates can be set. Be sure to make a note of the username and password used to create your account. This will allow you to log back in to your dashboard to receive important updates and communication regarding your application status. Depending on the role you have applied for, you may be required to complete a web-based interview. The interview can be accessed on any computer that has a high-speed internet connection and can be viewed in English, Spanish, or Haitian-Creole. If selected for an interview, you will receive email communication to schedule a date and time. Interviews may be conducted in person or over the phone. The interview will feel more like a conversation. Our goal is to assess the skills and abilities you would bring to the team. Be ready to showcase you. What are your interests and career goals? Do your research. Read the posting and make note of role responsibilities and requirements. If your interview is in person, the dress code is casual but feel free to dress for success. If selected for a role, we will work with you to complete post-offer employment steps and schedule an appointment to fill out your new-hire paperwork. Relocating? No problem! Your recruiter can assist with a plan for a future start date. Your first day of work will be at Disney University, where you are scheduled to attend Disney Traditions. Disney Traditions is more than a class, it’s your introduction to what makes Disney beloved and one-of-a-kind. After completing Disney Traditions, you’ll be ready to begin your role with the help of fellow cast members. Not ready to relocate or apply just yet? 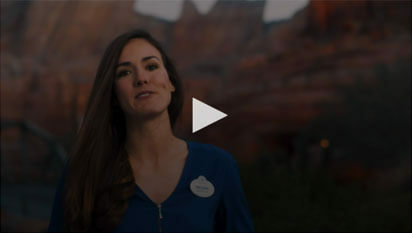 Stay connected with us on social media to get the latest updates on exciting opportunities at Disneyland or Walt Disney World Resorts!